All Things Brantley, All Things Tribe: The Indians Are the 2016 AL Central Division Champions! 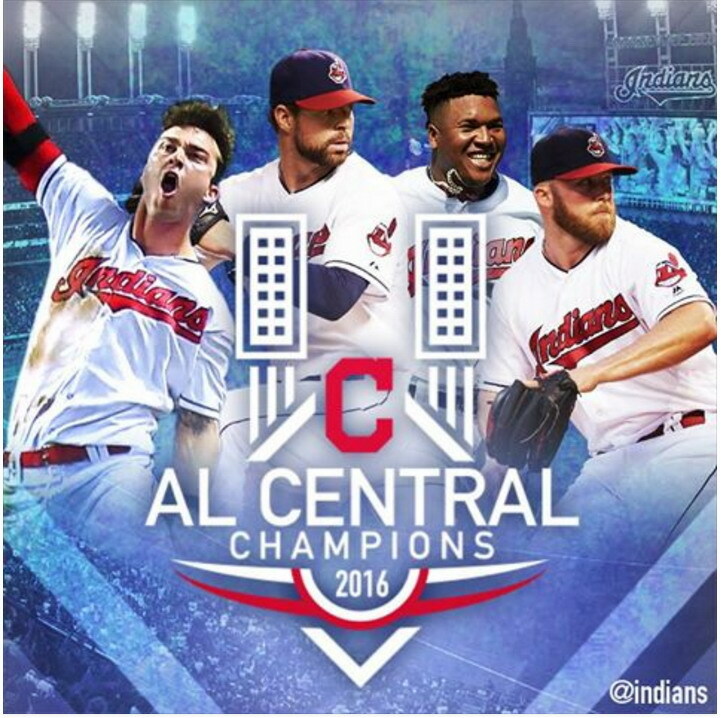 The Indians Are the 2016 AL Central Division Champions! 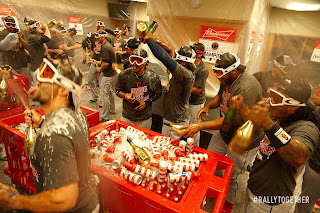 tonight, on September 26, after beating the Detroit Tigers in Game #156, the Cleveland Indians clinched the American League Central Division and secured their spot in the 2016 postseason AL Division Series! this is their first AL Central Division title since 2007 and eighth title overall in club history. it's been a looong nine years but it had to happen again sometime, right? congratulations, boys!!! Cody Allen struck out Cameron Maybin on a 1-2 count for the third out in the bottom of the 9th inning. you can watch the indians.com video of that here. 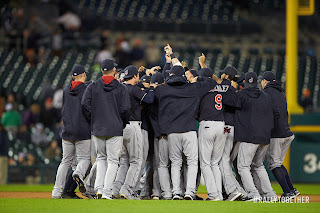 it was the perfect match-up because all the Indians had to do was get this win against the Tigers in order to officially eliminate them from the division race, as the Tigers were their only competition for the title. and now we get to see the Tribe play some October baseball that actually goes past the regular season! when the game was over, the players all ran out onto the field of Comerica Park to high five, hug, and congratulate each other. 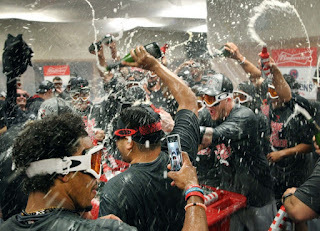 then they received their AL Central Champs t-shirts and hats. soon after, the celebration continued inside the visitors' clubhouse where they sprayed bottles of champagne and screamed joyous chants. "i can't get hit. i've got to look from the outskirts," Michael explained in Bastian's indians.com article. he leaned up against a wall with his arms folded across his chest and watched the festivities in the visitors' locker room from across the hallway. "to be here, to celebrate with your teammates, with all the hard work all the guys put in together as one, i don't know if there are the right words for it. "i'm excited to see what we do in the postseason." on the other hand, injured Carrasco was able to get right in the middle of everything after he put a plastic bag on over his cast. video aficionado Trevor Bauer used his GoPro to record the postgame madness and uploaded it to sqor.com. 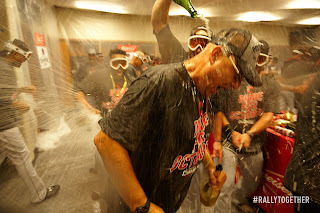 he clearly had a great time, spraying just about everyone in the locker room with beer and champagne. (he even got Michael at 12:00 and 14:00). so what were some of the players' feelings and reactions about the night? well, for starters, Meisel tweeted that Allen said getting the final out was a blur. "it was like asking my wife to marry me. i was so nervous, so excited." 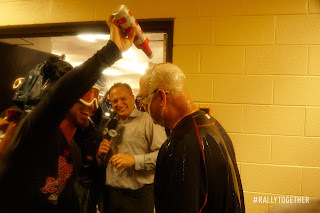 "i just feel a bunch of joy," Mike Napoli proclaimed after the clinch in Paul Hoynes' article on cleveland.com. "for me personally, i've had anxiety, butterflies. when you know you're close, it's just a good feeling... it's a feeling i've had every single time. i've been fortunate to be able to do this a bunch in my career. it's just something special. it's a good feeling." 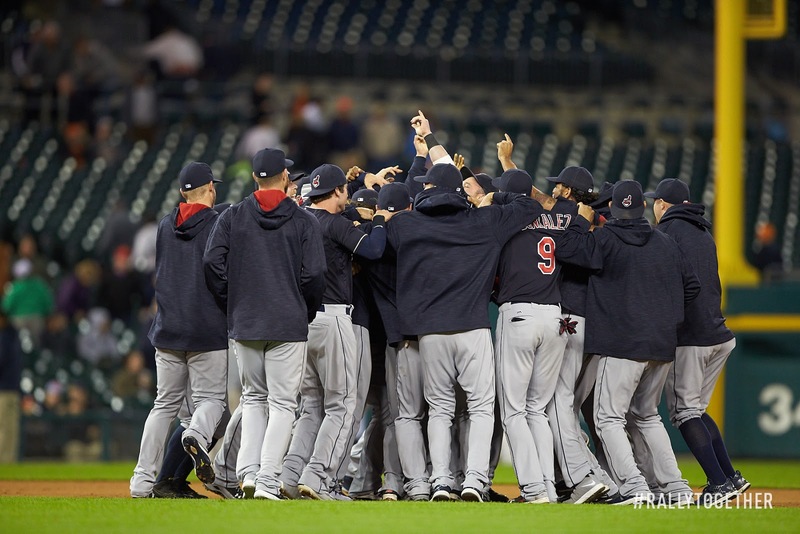 "this team is good for a reason," Andrew Miller shared in a second Hoynsie article on cleveland.com. "these guys know how to win. i'm just happy to be here and happy to be a part of it." "we were so certain that it was our year, that it was our turn," admitted Jason Kipnis in another postgame article from Bastian on indians.com. "i don't think you could convince us otherwise. as soon as we got a hold of first place, you probably saw the tightest grip on it ever. we never let go of it. that's how much this team competed. that's how much this team wanted it." in yet another indians.com article by Bastian, Kip continued. "i've been through this part. i haven't been through what comes next. ...this year, we're not just happy to be there. we're looking to make some noise. i know these guys are excited about what's to come." Indians manager Terry Francona encouraged the celebration. from Ryan Lewis' tweet, the skipper remarked, "they deserve every minute of it. i want them to celebrate. they should be so proud of what they did. we're proud of them. it's hard. there's a lot that goes into winning a division. they deserve every minute of joy they have in there. "hugging Brantley and Gomer and those guys, they're so much a part of what we're doing, even [when] hurt. we've had some challenges thrown at us, but so has everybody else, too. we've managed to get his far. now we get to play more baseball, which i think will have everybody, once they get through whatever they're doing, we'll regroup and know we get to play more, which is very exciting." --Brantley (their best hitter) dealing with shoulder issues for almost the entire season and only playing in 11 games. --Gomes' struggles at the plate and then going on the DL after he dislocated his shoulder. --Abraham Almonte's 80-game suspension because of his positive PED test. --Josh Tomlin being pulled from the rotation after losing five straight games in August. --Salazar's multiple arm problems spanning from just before the All Star Break to September. 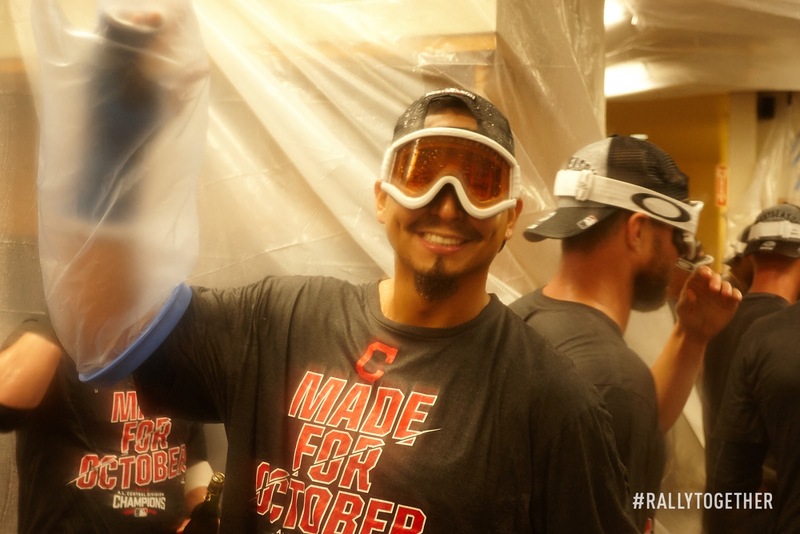 --Carrasco missing time after straining his hamstring in April and then suffering a broken pinky finger just two weeks before the end of the regular season. ...and those are just some of the adversities the Indians faced. so the fact that they still won their division (and currently have 91 wins and counting!) in spite of that is really an amazing accomplishment. you have to give credit and tip your cap to the players who've had standout seasons and made this possible. i'm talking about guys like Napoli, Jose Ramirez, Carlos Santana, Kipnis, and Rajai Davis. they all put up some career numbers for themselves this year. in addition, Tyler Naquin's had a very special big league debut season and is in consideration for Rookie of the Year. and first-time All Star Francisco Lindor played so well in 2016 that if you didn't know better, you wouldn't think it was just his sophomore season. 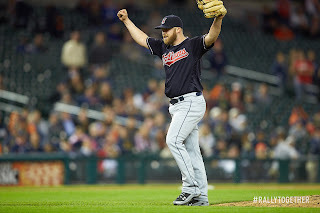 on the pitching side of things, Corey Kluber has amassed Cy Young-like numbers and trade deadline acquisition Miller might just be the most dominant arm we have in the bullpen. all those guys put together impressive performances this year and i am so proud of them! and don't forget to follow me on twitter @clevelandgirl23 for updates on Michael's recovery from surgery! you can also subscribe to my blog and get email alerts whenever i post something new by signing up on the right side of the page.